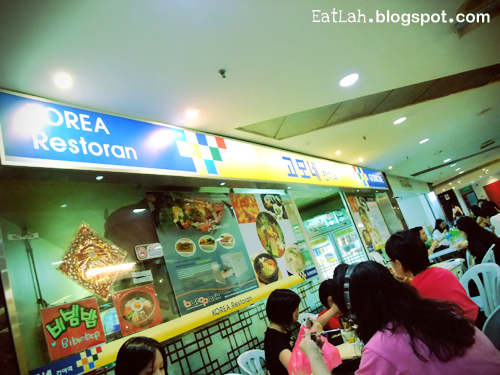 Gomone Korean Restaurant @ Ampang Point, Ampang | where and what to eat lah? Whenever we talk about bibimbap, this is the place we would go. It is halal and it serves bibimbap, kimchi, jajangmyeon, omelette pancake, bulgogi, etc. but except for bbq. 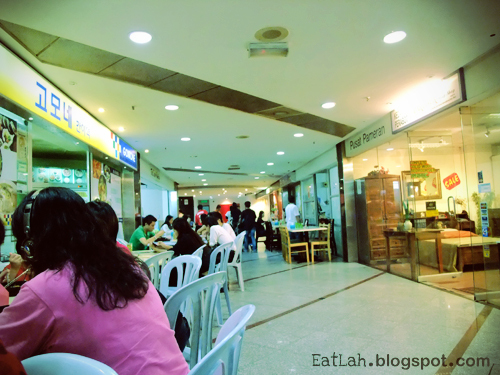 This restaurant is located inside Ampang Point and surprisingly, it is not featured anywhere at all. 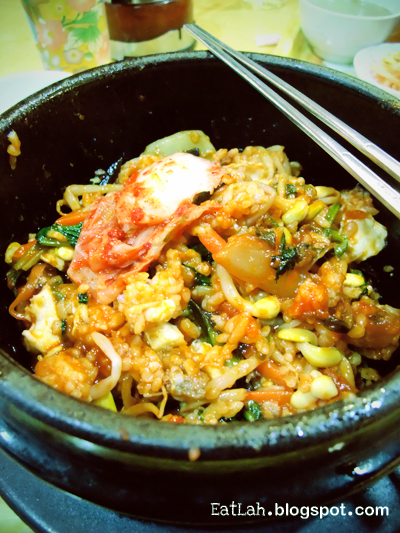 Usually, I will order my dol sot bibimbap (RM 13.00), which stands for stone-pot mixed rice. The bowl is sizzling hot and it can last till you are done eating, so careful of not touching it. 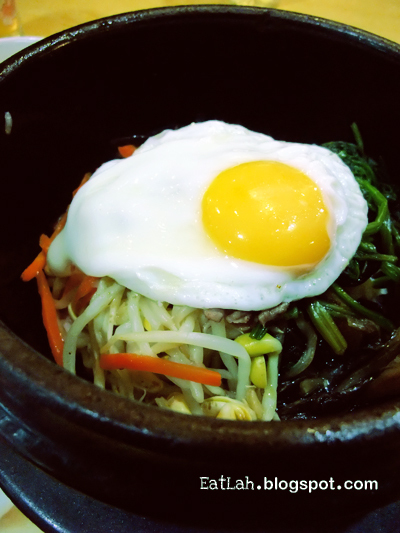 It is usually served with namul (sautéed and seasoned vegetables), raw egg and minced meat (either beef or chicken). Most of their main course comes side dishes such as kimchi, sautéed and seasoned vegetables, soup and complimentary free flow of rooibos tea. Not to forget mixing the gochujang paste into the bibimbap to enhance the flavor. This reddish paste is made of fermented soybeans and red pepper. It has a rich sweet piquant flavor and not spicy at all. 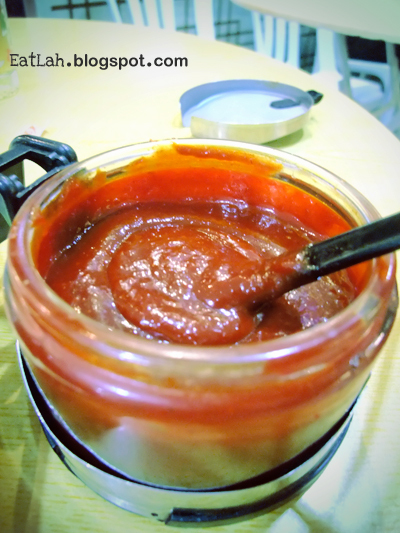 I usually do 4-5 spoonfuls of gochujang paste into my bibimbap for the extra umph! Before the rice is placed in the bowl, the bowl is coated with sesame oil. This creates a slight layer of golden crispy rice, and when mixed quick enough with the others, it gives a kind of fragrance and crispiness to the dish. 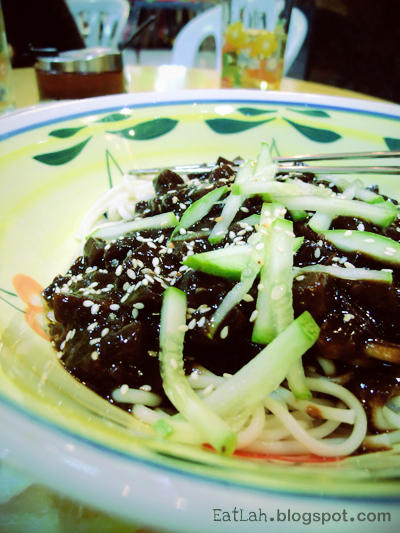 Another popular and favorite Korean dish of mine would be the jajangmyeon (RM 12) - wheat noodles topped with a thick sauce made of chunjang (a salty black soybean paste), diced potatoes and sliced raw cucumbers. This restaurant is on the 2nd floor of Ampang Point, next to Taiwan House restaurant and same floor with Popular Bookstore. Verdict: Highly recommended place for dol sot bibimbap! Tasty and value for money with big generous portion. I have tried it yesterday with a korean friend. He said it is good and the price is the same in Korea. The food is similar to Korea street style restaurant. It is really a wonderful meal which is not mixed up with thai, malaysia style of korea food. Lol..
hi.. just want to know.. how you know it is halal?? i'm sorry for asking its just that i want to eat korean food so badly and it is hard to find the halal ones..
Yeah I think so same goes for next door Taiwan House.